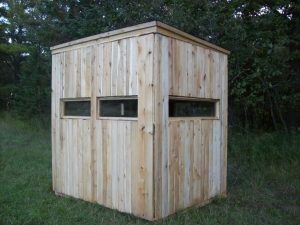 A hunting blind is a valuable tool that can make it much harder for deer to detect your presence, but it won’t do you much good without some careful preparation. Today we’ll look at a few strategies you can use to make your ground blind as effective as possible on your next hunting excursion. Scout out locations in advance. Prior to the start of your hunting season, spend some time scouting different locations in your area and choose one that will put you in a good position to spot deer before they spot you. You might find a well-worn deer trail, for example, and set up your blind about 50 yards from a bend in the trail in some dense brush. This way, you can catch deer by surprise when they come around the bend. Camouflage your hunting blind with grass, brush, sticks and more. You can make your blind even harder for deer to spot by covering it with local vegetation. This natural camouflage will not only keep your hunting blind out of sight, but also help to mask your scent as well. If you’re feeling ambitious, you can paint your blind to match its surroundings as well. Avoid limiting your own field of view. While it’s a good idea to position your blind off the beaten path, you don’t want to put it in a place that will limit your ability to see approaching deer. Try to find a place that is concealed, but not blocked by trees, hills and other features of the terrain. At Productive Cedar Products, we offer a diverse selection of durable wooden ground blinds that are designed to give hunters a leg up on their quarry. Browse our products online or give us a call at (989) 727-4902 today to learn more!